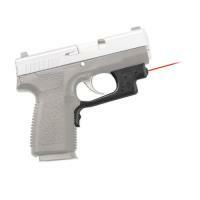 Crimson Trace LG-434 LG-434 Laser Guard For Kahr Arms .45 FREE SHIPPING! have many gun grips & accessories to choose from. The Crimson Trace LG-434 Laser Guard for Kahr Arms .45 attaches easily to your trigger guard giving you instant advantage when using it for defensive purposes. Designed to fit on the Kahr Arms .45, the low profile LG-434 laser is easily activated via a rubber overmold activation just by gripping your gun naturally. Using one 1/3N lithium or two 357 silver oxide batteries, the powerful red laser gives you a .5 inch dot at 50" and can run for over four hours. Made from polymer material that is durable, the LG-434 installs onto the trigger guard with no gunsmithing needed. Additional features of this laser guard are the adjustable windage and elevation for accurate shots and its backing by a three year full warranty. ©2002-2019 CopsPlus.com: Crimson Trace LG-434 LG-434 Laser Guard For Kahr Arms .45 FREE SHIPPING!